The 7266 Stationary Living Room Group by Craftmaster at Jacksonville Furniture Mart in the Jacksonville, Gainesville, Palm Coast, Fernandina Beach area. Product availability may vary. Contact us for the most current availability on this product. Leg or Skirt Finished wood bun feet. 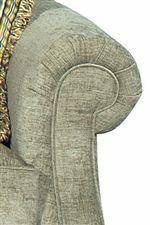 Arm Type Traditional pleated rolled arms with welt trim. Padding & Ergonomics Heavily padded arms, 100% Dacron polyester fiber back cushion encased in sewn ticking with separate compartments. 2.0 High density Preserve High Resilient foam, wrapped in a thick fiber batting, and encased in a down proof ticking. ComfortSoft is a high-resilience, bio-based foam that provides long lasting performance and durability. 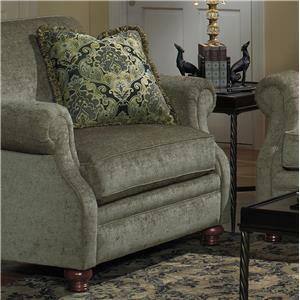 This collection brings you transitional living room furniture that is stylish as well as comfortable and durable. Stability is created from the beginning with frames that are double dowelled, glued and corner blocked. The high resiliency foam core and heavily padded arms make these pieces comfortable. Stylish with pleated rolled arms and exposed wood bun feet, these pieces allow you to show off your personality with the many fabric options. Pair a sofa with a love seat (not shown) or a chair and ottoman (not shown) to complete your living room and create a space you want to show off. 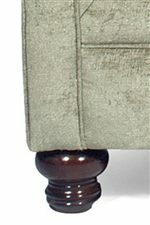 The 7266 collection is a great option if you are looking for Transitional furniture in the Jacksonville, Gainesville, Palm Coast, Fernandina Beach area. Browse other items in the 7266 collection from Jacksonville Furniture Mart in the Jacksonville, Gainesville, Palm Coast, Fernandina Beach area.